"At a certain point, the gears shift and kids became more passionate. That’s when the switch to travel comes into place." New Orleans area parents and coaches discuss the benefits and drawbacks of youth travel teams and why it’s different from school or playground sports. Imagine: Jimmy has a knack for sports. His every move is graceful, but swift and purposeful. But he’s 10 years old. The neighborhood playground lacks an experienced coach and Jimmy’s school doesn’t offer competitive sports until high school. He’s passionate about refining his skills, so what are his options? When rec centers and playgrounds dominated the neighborhood sports scene, travel teams existed mostly on the periphery of youth athletics by way of baseball and football. Parents, perhaps looking for a streamlined path to the majors and a more competitive boot camp-like environment, might have signed up their kids for these more expensive travel teams. In more recent years, travel teams have become more accessible and include competitions in soccer, volleyball, golf, and gymnastics, but still operate as relatively pricey elite teams who transverse the country competing in standardized brackets, districts, and divisions — apart from organized school sports and rec centers. If his parents are willing to put in time and money — in a way, matching their son’s ambition themselves — Jimmy’s athletic talent might grow within the kind of focus a travel team affords. Sportsmanship is a lesson learned for Gavin, 10, and Finley Hardie, 13. Photo by Twirl Photography. 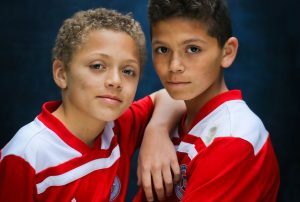 One parent, New Orleans resident Polly Hardie, chose a travel team for her two sons, Gavin, 10, and Finley, 13, for that very focus. The key difference between travel soccer and recreational soccer for Hardie is that the coaches are professionals versus volunteers. Hardie believes travel teams are for kids who want to gain a deeper and more meaningful attachment to their chosen sport. Jessica Wertz’s sons, Dylon, 13, and Dean, 8, play travel baseball on the Northshore. Dylon plays for the Mandeville Beasts and Dean plays for the Northshore Majors. Wertz says recreational teams have their place, as they start the process and lay a foundation, but a change in your kid’s motivations signals when it might be time to move on to travel teams. But are travel teams always only about beating the best — winning over fun? Kimberly says he founded the LBSA, which offers travel teams as well as other sports-related programs, to help baseball and softball players of all ages become the best player possible, regardless of their ability level. While there has been some backlash towards travel ball, mostly by community sports enthusiasts, Kimberly is adamant that there is room for both to coexist. Danny Davis, head coach and director of the all-girls volleyball club Crescent City Juniors in Gretna, agrees that fun should be a priority. While travel teams can be demanding, he says the goal is for kids to learn and have fun. 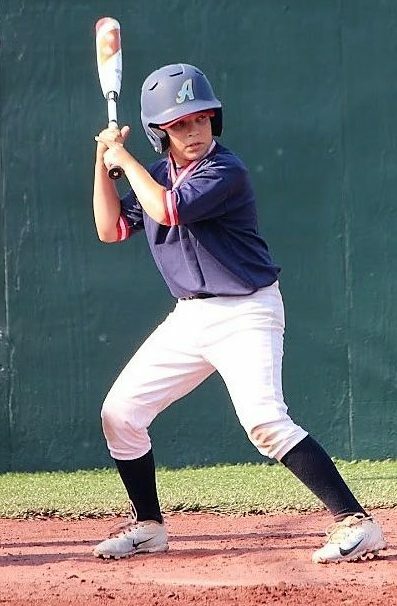 Dylon Wertz, 13, at bat during a tournament in N.Y. last year. Photo by Katheryn Carroll. “The ultimate goal for my players is to have fun through learning the fundamentals and value of the game, the development of positive attitudes, teamwork, and the importance of preparation for top-level competition,” he says. But travel volleyball isn’t for everyone. Despite the fun, all travel teams are still a commitment on both time and money. Davis believes parents should expect a higher level of competition, just like with other travel teams, from the traditional recreational and playground leagues. Wertz’s sons practice a couple of times a week and play in two to three tournaments a month. The tournaments are rarely more than an hour’s drive, but occasionally one is held further away. As for cost, Wertz pays on average $300 to $600 a year in team dues, which covers uniforms, tournament entry fees, baseballs, practice field rental fees, and more. We asked parents first-hand what they wish they had known, or advise they might have. -Bring trash bags for muddy clothes (and to protect car interiors). -Bring old newspapers to dry wet cleats. -Bond with teammates at dinners and activities; it makes for a strong team (and lifelong friendships). -Do research on the coaching staff, they will be spending a lot of time with your children. It needs to be a good, comfortable fit. -Along those lines, ‘shop’ travel teams, there are usually several, it needs to work for your child. -Find hotel/airbnbs nearby, with kitchenettes. Share rooms if you can. -Hunt down your kids uniforms yourself. Don't believe them when they say the uniforms are clean. That's true at 5 and at 16. -Recognize long car rides are great opportunities to share. -Don't assume just because you are spending thousands of dollars on this that they will play it in college, or even a scholarship. -Bring bleacher cushions and folding chairs. Bring extras for the parents that forgot them. -Lean in and enjoy it!